Motorcycle books are great. Reading is great. 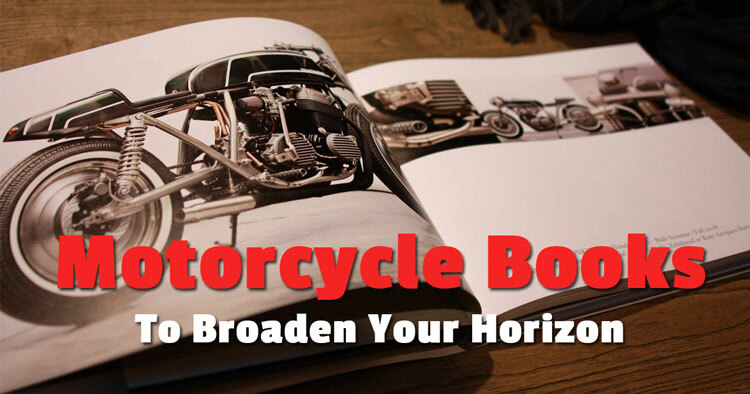 Of course, riding a motorcycle is even greater, but if you’re not riding, reading a book about motorcycles can be a great way to broaden your horizon. A book can educate or entertain and best of all thanks to advances in witchcraft, you can download it to your smartphone or kindle and read it anytime, anywhere. I remember the shed of my grandfather, which had a dedicated corner full of motorcycle books, magazines, and manuals. He was one of those guys who literally was married with motorcycles. When he was not riding or restoring them he was reading about them. Personally, on the odd occasion, I get to go on vacation, there is nothing like sitting in the sun with a beer and a book. Obviously, everyone’s tastes differ so here is a cross section of motorcycle books, which I think may float your boat. Great to read as a petrolhead and an original gift for petrolheads. 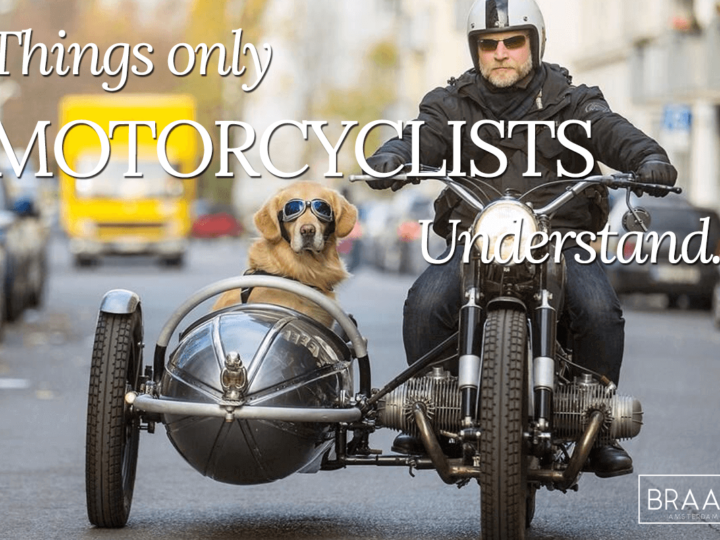 By the way, I really tried to include a fiction based motorcycle book in this list but for the life of me, couldn’t find one that deserved a place. That’s not to say they aren’t out there, but front covers with a Mills and Boon style hero with a stick-on tattoo just don’t cut it. I hope you like it, and if you have any suggestions, feel free to put them in the comment section! Probably the first motorcycle racer to cross the bridge between sportsman and celebrity, Bazza was the real deal. A hard- drinking chain-smoking Jack the Lad who lived life to the full. Best known for his red, black and yellow Heron Suzuki bike and matching leathers, Sheene even had a hole drilled in the chin bar of his helmet so he could carry on smoking right up to the start of a race. Top Tip: If you like you like your bike racers a little more contemporary you should also check out the Doctor’s autobiography. What If I Had Never Tried, by Valentino Rossi. Don’t get me wrong, I’m a massive fan of ‘Long Way Round’, but if you think a couple of celebs on two-wheeled Range Rovers with a film crew in tow is adventure bike riding then ‘Around the World’ will set you straight. It maps out the ride of two Hungarian guys who traversed the word on a Harley sidecar outfit in the years between the wars. 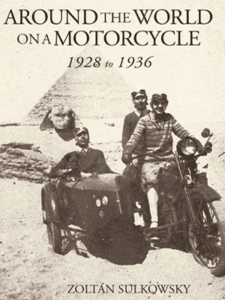 Ok, it’s not an adventure bike book as we know them today, but it gives a real snapshot of life in the 1930’s. If you’ve seen the movie of the same name, then you’re going to love this. 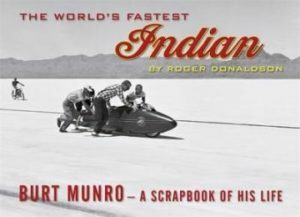 This is the life in pictures of the real Burt Munro. Roger Donaldson interviewed the bike mad New Zealander way back in 1971 for a documentary called ‘Offerings to the God of Speed’ and it was also Donaldson that directed the hit movie of the same name, starring Anthony Hopkins. 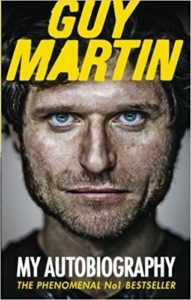 Straight talking, tea-swilling Guy Martin is as entertaining off his race bikes as he is on. 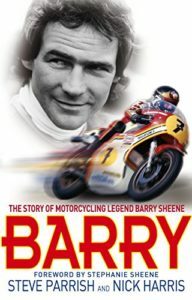 This book tells the life story of the no-nonsense often controversial, media-shy man and his phenomenal motorcycle-racing career. His down to earth approach to life and his dogged determination and drive has won him fans the world over. Even at the height of his racing and media career, Martin could still be found working on Scania trucks in his hometown of Grimsby. A complete motor-head, Martin has also broken several speed records from riding a pushbike at 110mph to the fastest lap on a Wall of Death. 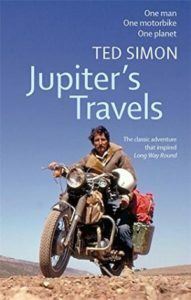 Written 40 something years ago, this is probably the book that kicked off motorcycle-borne wanderlust in a whole generation of bikers and entirely to blame for Ewan McGregor and Charley Boorman’s, ‘Long Way Round’ saga. It’s the story of Ted Simon and his four years long trip around the world on his trusty Triumph Tiger 500. 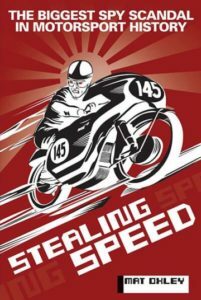 One of those stranger than fiction books about how Nazi Rocket engineering secrets were smuggled out of east Germany and handed over to a Japanese Motorcycle manufacturer. The book provides the racing spirit on the background of technological breakthrough as well as major political events. 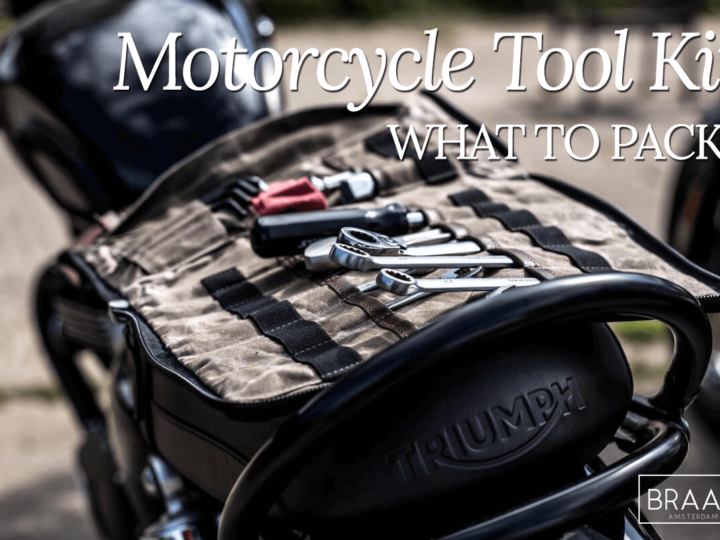 A motorcycle book about customs could not be skipped in this overview. 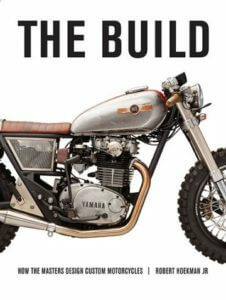 And I think that the best reference for custom motorcycles is “The Build” by Robert Hoekman Jr, which is also considered being the “custom motorcycle bible”. When searching for motorcycle books you’ll notice that there are a lot of travel/adventure books out there. Unfortunately not all adventurers are great writers… Allan Karl not only has a feeling for adventure, he also has a very sharp eye (and camera!) and was able to write down his journey in a very amusing way. After a divorce and left unemployed, Allen decided to sell almost all of his belongings to travel around the world on a motorcycle. In three years he traveled 62,000 miles across 35 countries on 5 continents. 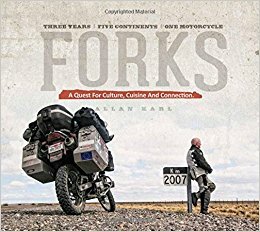 In Forks he shares his adventures though stories, high quality photo’s and recipes with local flavor. Most interesting about this book is his experience with what he calls “the human connection”. Yes, I know it’s not a motorcycle book, but keep reading. If you’ve ever waved a spanner over a bike regardless of what make or model, then chances are, you’ve got a Haynes manual somewhere with oily fingerprints on the pages. I think that’s why this book appealed to me so much. 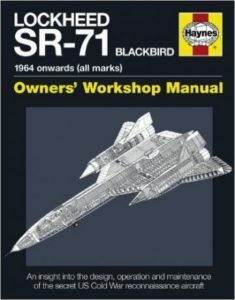 It’s a Haynes Manual, but for probably the most infamous military aircraft of the cold war era, or any era for that matter. The Stealth Jet. Other Motorcycle Books We Should Read? These motorcycle books (exept the last one) are pretty much the best books you can read or give to your motorcyclist friend(s). Got another great read which is not listed? Leave your comment!